"The magic of this anthology of women is in its radical reflection that “we are every woman,” and women are NOT the same. We do not need to pretend to sameness in order to express what is most essential about us—that is—our very existence, and our engaged faith experiences. Whatever Works is a unique collection of writing by feminists of diverse faiths from around the world. 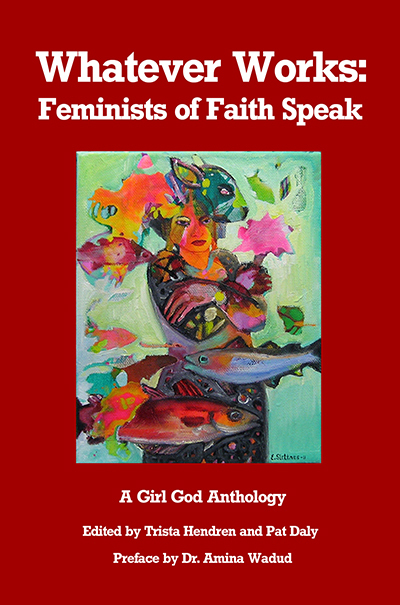 This anthology combines personal essays, poems and academic musings with the goal of sparking conversations among women of all faith backgrounds. Religion plays a key role in defining and maintaining value systems, and yet it is often disregarded within feminism itself. This book shares the stories of highly diverse women with the hope that we can find collective solutions to the global problems that plague women and girls living under patriarchy. Soraya Chemaly, Rev. Dr. Karen Tate, Shehnaz Haqqani, Priestess Bairavee Balasubramaniam, Ph.D., Monette Chilson, Sarah Ager, Pegi Eyers, Susan Mehegan, Jacqueline Hope Derby, Jen Raffensperger, Elizabeth Hall Magill, Zoharah Noy-meir, Rebecca Mott, Liona Rowan, Metis, DeAnna L'am, Patty Kay, Zoe Nicholson, Erin McKelle, Rabbi Dalia Marx Ph.D., Debbie Kozlovich, Vanessa Rivera de la Fuente,Vrinda Jamuna Shakti, Lora Koetsier, Lizette Galima Tapia-Raquel, Nafhesa Ali, Susan Morgaine, Trista Hendren, Ruth Calder Murphy, Celeste Gurevich, Nahida Nisa and Neorah García. All other countries - search for Trista Hendren on your local Amazon site.